This is the website and personal archive of David Sutton, who writes as David C. Sutton. It assembles writings and speeches since 1980, organised under ten main subject areas (listed in the Content Menu). The range of subject material is wide. 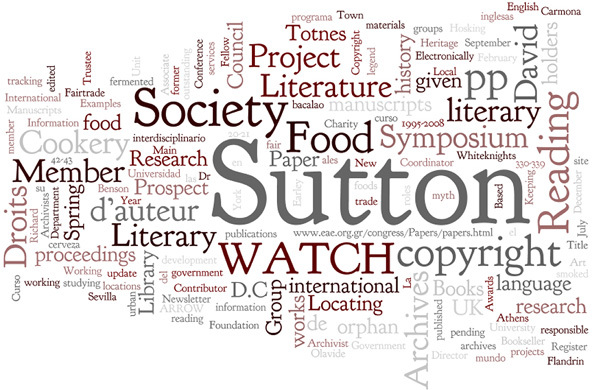 David Sutton has been a literary scholar (and in particular a specialist in literary manuscripts), a copyright researcher, and a writer on international aspects of copyright law. He is President of the Section for Literary Archives of the International Council on Archives, and Chair of the Group for Literary Archives and Manuscripts (GLAM). In another part of his life he has been a trade unionist, internationalist campaigner and local politician (Leader of Reading Borough Council, 1995-2008). He studied food history in Paris in the 1970s, and has been a contributor to the Oxford Symposium on Food and Cookery. He was a speaker on urbanism at the Urban Summit, Birmingham 2002, and Expo 2005, Aichi, Japan. His interest in internationalism and town-twinning is also reflected here; he is presently convenor of the Reading Fair Trade Town Group.